As a Douglas College science student, I was fortunate to attend the 2011 Belize Field School, which had an arts-based curriculum. Being from a different program allowed me to have unique experiences on the class excursions. We saw many of Belize’s hidden treasures, such as the Actun Cabal cave, which we visited as part of our anthropology class. This was a rare opportunity as the cave is in a remote part of the Chiquibul Forest. Several of the locals reassured us about how lucky we were to explore the caves, as they had not yet had this opportunity themselves. We took guided tours of ancient Mayan ruins such as Caracol, Cahal Pech, Lamanai and a site that was just being excavated, Lower Dover. Our guides told personal stories about sites they had worked on. Lower Dover was my favourite site because it was in the process of being excavated and we got to watch a team of archaeologists at work. The class excursions immersed us in Mayan history and culture, which made the concepts we were learning in class very real. Visiting these sites enriched our learning by helping us connect the course content to real life experiences. Sarah examines a hermit crab. 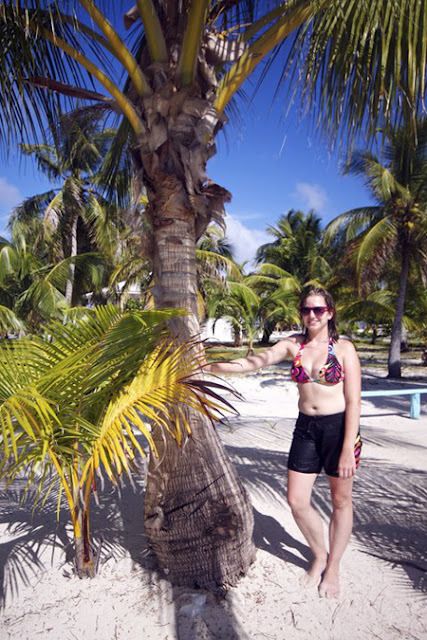 During our final week we stayed in South Water Caye,a small island over the Belize barrier reef. Classes were officially over and we had five days to relax and enjoy the sandy beaches and crystal blue water. We snorkelled right off of the beach and took boating trips to explore the reefs farther out. On one small island there’s a marine biology station, which let us attend lectures they were giving for their students. 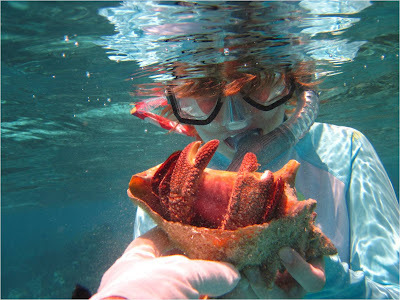 A marine biologist snorkelled with us and took pictures of marine life that he later featured in his lecture. The marine life we saw included corals, tropical fish, sting rays, sea turtles and sharks. As a biologist, I was definitely in my element. I knew that this once-in-a-lifetime experience was something most people only dream of. Sarah (left) and fellow field school participant Maria Asselin-Roy bliss out in the crystal clear waters off Belize. The students and teachers that took part in the field school will undoubtedly have permanent connections to one another. Even though we each took something different away from the trip, whether in the classroom or out in the field, we shared the experience together. We now have lasting memories and meaningful relationships that are the result of our time spent exploring another country together. To find out more about Douglas College field schools, visit our website.